In case you missed it, Rag and Bone announced something we didn’t know we needed until we got it: Rag and Bone x Star Wars. I know, I know. Breathe. From sweatshirts to shoes to limited edition tees, the collaboration is the perfect combination of Rag and Bone's classic directional, modern design with a touch of galactic goodness. It will be available for purchase on December 1st, but you can view the full collection to start planning your shopping spree here. ‘Tis the season for Disney Magic and nobody’s complaining about it. Torrid just dropped a collection inspired by your favorite Disney princesses, making all your fairytale dreams come true. Ever dreamed of wearing a dress that’s the perfect mix of playful and feminine and has subtle details of your favorite Disney leading ladies at the hem? In this case, dreams do come true. So, perhaps this one isn’t new, but it’s new to me. My knowledge of nerdy makeup has never extended far past our friends at Espionage or the occasional collaboration from a bigger brand (hey, M.A.C., do you plan on bringing back that Wonder Woman line anytime soon? ), so stumbling upon Geek Chic Cosmetics this month was pretty exciting. The most exciting part? 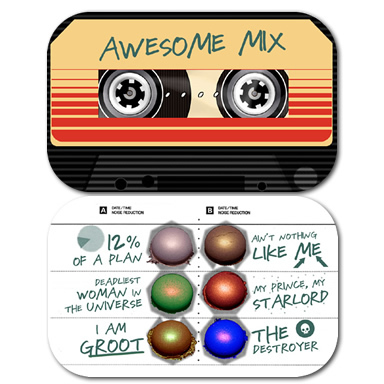 The Awesome Mix Collector’s Tin. Star-Lord took a permanent residence on my wrist almost four years ago, so this was clearly an instant purchase. The shades are as colorful and unique as my favorite franchise itself, and the Awesome Mix packaging is just an added bonus. Check back in a few weeks when I test it out! What were your favorite geeky products this month? Comment and let us know!